Once assessment results have been uploaded into SchoolCity, either by scanning, GradeCam™, online administration, or data importing, the data can be viewed in a variety of ways. One of the Predefined Reports in SchoolCity SUITE is the Test Results Report. The Test Results Report displays student level overall performance data for the selected assessment. This report includes all available score values (Raw Score, Percent Correct, Performance Level), as well as demographic information such as English Learner, Special Education and Ethnicity. Click on the Test Results name in blue or on the view icon (eye) to the far right to go to the Test Results report. Note the descriptor statement for this report. Select Test Results to go to the report. Filter Students: Click here to view results for specific subgroups of students. Full Screen: Click here to view the report in full screen. Interactive Charts: (Pie Chart displayed) Illustrates Performance Level data in the table. Hover over each section to view details. Click on Chart Settings, Chart Type, Edit Chart Labels, Chart Full Screen to view the test results with other charts. Select All Records: Check this box to select all records when the number of records exceeds the screen display (greater than 50). Show Demographics (optional): Uncheck the green box to hide demographics of EL, Special Ed, and Ethnicity. Show Time Spent (optional): Check the box to view the time spent on the assessment; uncheck to hide. Show Pie Chart (optional): Check the box to view the chart; uncheck to hide. Show Proficient/Non Proficient or By Performance Level: Check the desired box to view; uncheck to hide. Student Results: ID #, Name, Grade, Raw Score, % Correct, Performance Level, and Demographics. 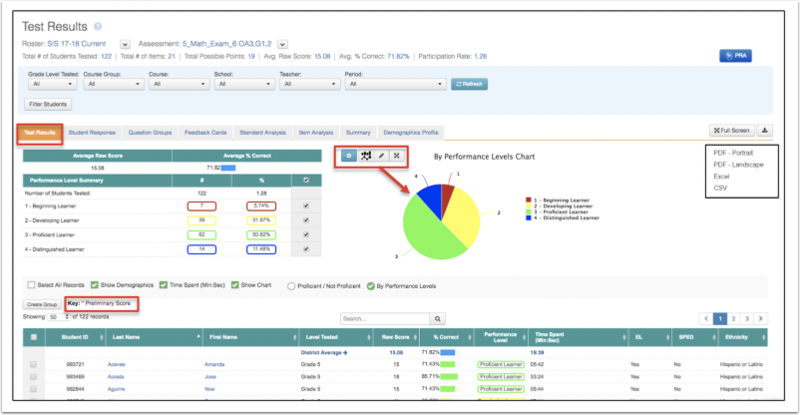 Hover over a section of the pie chart to see the Performance Level name and summary data. Click on that section of the pie chart. In the table, notice that only that level has a check mark next to it. Students are listed alphabetically by default, but the columns can be reordered by clicking on the column header. In the example below, students were ordered from lowest to highest by clicking once on the Raw Score header. Reorder students from highest to lowest by clicking on the header again. Note: Only one column can be reordered at one time. To view the Student History report for any student on the roster of the Test Results report, click on the student’s last or first name. Please see the Help document, Reports: Student History Report, for more information.